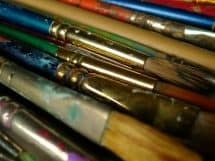 What if I mess up homeschooling high school and my child doesn’t have everything he needs to graduate? I had this question myself, and I hear it now from homeschool moms all. the. time. But the good news is that this concern over homeschool graduation requirements, while very common, is also easily dispelled! That’s my job today — to give you everything you need to know about homeschool graduation requirements, so you can be well-informed and feel confident as you are homeschooling high school. I consider the encouragement of moms who are homeschooling teens as one of my big missions in life, because I believe EVERY mom can provide the high school education her teen needs! So let’s get right to it, because you’re going to be amazed how easy this is. Here goes; are you ready? Suspenseful distraction right here to just say that all of this information — AND MUCH MORE — can be found in my book about homeschooling high school. It’s called CURE THE FEAR OF HOMESCHOOLING HIGH SCHOOL: A Step-by-Step Handbook for Research & Planning (so you can be sure you’re not missing anything!) — and if you find the information you’re about to read helpful, then this book is for you! It takes you from square one of doing the research to find out what you NEED to do all the way through making a complete coursework plan for your child. With EIGHT pretty printables to make it all more fun! Check it out here: Cure the Fear of Homeschooling High School. MOST STATES DON’T HAVE ANY. Wait, what? you say. Repeat that, please? you ask. Happy to oblige: Most states do not have ANY graduation requirements for homeschool students. But why do I see graduation requirements listed on my state’s education website? you demand. Be aware that while all states do have PUBLIC SCHOOL graduation requirements, those DO NOT apply to homeschoolers. You do NOT have to fulfill them. Only a handful of states have HOMESCHOOL graduation requirements. If your state homeschool law does not specifically say a child must complete x, y, & z to graduate, then your state probably doesn’t have any!! My information comes from a very scientific source (cough cough). You see, we took a poll in the FB group. 🙂 (Seriously, though, it is your responsibility to research your own state — but our results will give you an idea of where you might stand.) In that very informal poll, the only states reported to have homeschool graduation requirements are PA and NY. In CA, LA, and TN, it depends which path you take (and if you live in those states you probably know your options). In the VAST MAJORITY of states (although some were not accounted for), there were NO graduation requirements for homeschooled students. Nope. Zilch. Noodle! Guess what? That means that for most of you out there, you can determine your own graduation requirements. YOU can decide how many credits of math, or how many of English, or history, or whether a foreign language is necessary, or if PE is something you want to mess with (I didn’t, lol). I recommend coming up with a general idea of what you would like your graduates to have accomplished when you do your initial curriculum planning process that takes place before ninth grade. That way you can come up with a four-year plan to aim for. 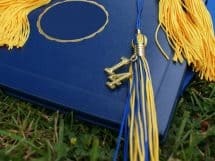 I talk a little more about determining your homeschool graduation requirements and a four-year plan in my post called How to Create A High School Homeschool Curriculum Plan in Four Simple Steps. But won’t my kid have a better chance to get into college if we follow the public school requirements? you ask. This is a common misconception, but it is absolutely not true. Colleges know that public school requirements vary widely from state to state — so they can’t base their admissions policies on them, since they draw students from many states. Colleges have their own admissions requirements, and those are what you want to be concerned about. The best thing to do is research a few colleges and find out what they expect their applicants to have accomplished — I discuss how to do this in How to KNOW What Your Teen NEEDS to Get Into College. You’ll find that college admissions requirements are usually much less demanding than public school graduation requirements, which should give you a sense of relief and of freedom. You can individualize the requirements to each child. You don’t have to have the same set of requirements for all of your children. One might be required to do more math (maybe they are planning a technical major in college), or you might allow another to replace literature with philosophy, if that is their bent. Or you might have a special needs child, whose requirements need to be more closely tailored to their strengths or weaknesses. You can adapt your requirements to your family homeschool philosophy. If you are unschoolers, you might eschew the entire grading system and find a different way to assign credits. Or even “conventional” homeschoolers may prefer an emphasis on literature/living books or practical experience or whole language learning or scientific experimentation or whatever else. 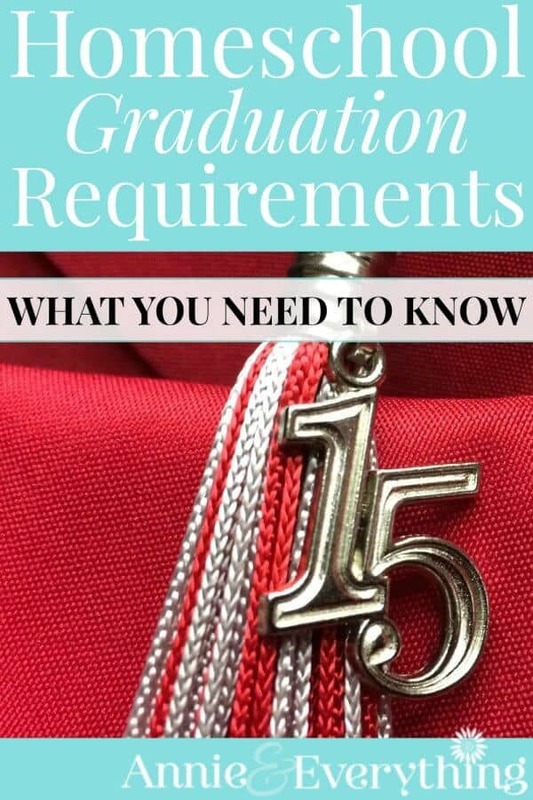 You can outright MODIFY your graduation requirements as your circumstances or needs change. What you determine before your child enters high school may not reflect their needs by the time they hit junior year (or whenever). My one child hated math but loved languages. 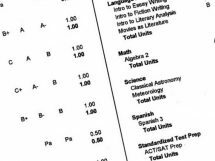 So somewhere in the middle of her high school years, we let go of a math credit and added more language credits to her “requirements.” There are also life circumstances that get in the way — maybe finances or a death in the family mean you have to scale way back on what you thought you would require. It’s all THOROUGHLY OK. The key to remember is that since YOU decide all this, your child is not “missing something.” No high school education is going to cover all the wisdom and knowledge of man, lol. What you deem important for your child to know is what your requirements will be. Let the rest go!! The moral of this story is this: be very familiar with your state’s homeschool laws. One of the best places to find out what they are is HSLDA.org. Or do an internet search for “Missouri homeschool law” (for example). (Although some bonus info is that I homeschool in MO, so I can tell you without a doubt that there are NO graduation requirements for homeschoolers in our lovely state!!) 🙂 Most states have homeschool organizations that can explain the law to you if you are unsure. Moral #2: Do NOT let the fear-mongers make you feel like you have to jump through a lot of hoops or your kid won’t succeed or get into college. Those are most often public school representatives, have you noticed that? Like the math teacher down the street, or the mom of your kid’s childhood friend. It’s usually people who have NO CLUE about homeschooling, but they think they have the right to voice their opinion, regardless. Gotta love ’em — but don’t believe ’em. This is an awesome article…. I am in California and I file an affidavit and am considered a private school under the law. I just read this: ** Instruction must be offered “in the several branches of study required to be taught in the public schools.” The materials and methods you use to teach these areas are up to you. You are not required to teach every subject as long as it is offered and available to the student** That last sentence caught my attention. They list all the core plus things like health, drivers ed, P.E., foreign language. But it says you are not required to teach all just that it’s offered. My oldest started taking Cleps at the end of 11th grade. She has been doing a combo of Clep, community college and online to get a degree. We did not do SAT or ACT tests because of this route. She is a musician and will have accomplished four years of piano. Self taught guitar. Huge accomplishments in this area and I’ve been stressing over the math. My family just moved from Kentucky to Missouri. While I do realize that Missouri is a great state to homeschool, the differences of requirements from each state is different. I am so concerned that I am going to mess his high school transcript up, which will make it very difficult for him to get into college. From what I gathered from this information you posted, Missouri doesn’t have any specific course requirements to graduate. Thus, what is listed on the public school site stating 1 full year of physical education, fine arts, and practical arts are not necessary for my senior to graduate? We came from Kentucky and had his whole high school year planned out. Under the Kentucky’s state requirement to graduate, we only needed 1/2 of each of the previous three. Now, his whole senior year is messed up if we have to add 1 1/2 more credits in these fields. We both feel overwhelmed. The move in itself is very tough, but trying to get through his senior year without adding chaos would be great. As long as we have 24 credits in solid courses, we will be fine? Thanks for any words of wisdom you can give? I absolutely needed to read all of this. I feel so much better right now. Thank you! I needed this encouragement tonight. I’m going to start reading your blog. Thanks! I really had no idea! I planned to research our state’s requirements this summer before my oldest started high school next year. Pinned. I’m wanting to graduate my daughter on her birthday. She’s completed all that I feel is necessary. I can’t find the answer any where online or in the Texas homeschool law website, if I’m required to homeschool all the way through to may, when other schools are done for the year. And I don’t see anything about the number of days required to home school each yr. Do high schoolers have to have 4 yrs of high school? She’s a senior. Can I graduate her early? You home school teens in MO? I’m struggling to find other preteen boys that are home schooled. I’m in the Northland of KC. I wish I could help, but I am in Southwest MO! Are you a member of my Facebook group? Jump in there and ask for others in your area — I know they are there! You can join here: It’s Not that Hard to Homeschool High School. I have a question, LOL. I don’t know if you have an answer for me but I’ll try. My son has graduated home school and would like to go into the military. We are in Colorado. Do you have any idea what we need to make that happen for him? Hi, unfortunately no, I don’t know anything about that. Sorry I can’t help! No Gabrielle, I’m sorry but I don’t. I deal with homeschooling, so I have no information about public school online. Thanks for stopping by!